ordable, fun, and educational parties. They know how time-consuming it can be to put together a birthday party, which is why they deliver high-quality, theme-related birthday party favors, supplies, piÃ±atas, and personalized items directly to their customers' doors. Their dedication has earned the 2007 Online Party Retailer of the Year Award, both Dr. Toy and Parentsâ€™ Choice Awards, inspired recognition in national parenting publications, and prompted Newsweek to write Birthday in a Box "is what your childâ€™s kindergarten teacher might recommend." Voted "Kids Best Overall" by The Wall Street Journal, you can be assured that they deliver the exact supplies and planning guides that will make your visitorsâ€™ parties a complete success! They offer more than 200 themes appropriate for children of all ages in addition to baby shower party supplies. 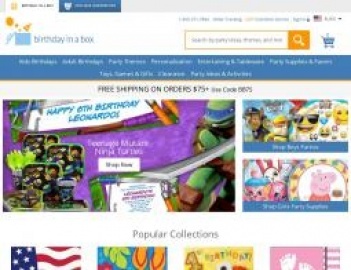 Click a Coupon or click Start Shopping to earn 2% Cash Back at Birthday in a Box.